Because the Curvature Series is custom made to order, you get to choose from 37 Top Grain Leather Colors, 26 Duralux Fabric Colors, or 54 Microfiber Colors. The sets are shipped directly from the factory and delivered to you by our in-home White Glove delivery service (normal delivery is 5 - 6 weeks). Add Power Recline Option for only 79.00 per seat. Add Power Recline and Headrest Option for only 150.00 per seat. Save $200.00 on matching Reclining Chairs when ordered with Sofa or Loveset. 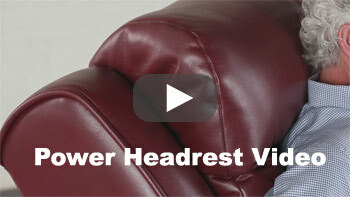 The new Power headrest option takes the power reclining option to a whole new dimension. It now allows you to electronically adjust its headrest, giving infinite possible positions. Of course you can still adjust your reclining position using Southern Motion's sub 6-second power motor but an additional motor, completely independent, now drives the adjustable headrest. It's great for sleeping, and with the adjustable headrest, it's also great for reading or watching TV. No more is there a need for that ole' throw pillow from the sofa. Simply adjust the headrest to whatever angle fits your physique and allows you to reach a new level of comfort. A fresh combination of Home Theater styling with a 'Conversation Sofa' blends the best of both worlds. The center seat of the Curvature has subtle shaping that helps to bring together the end reclining seats with the middle seat that has flanking drop down tables. Definitely unique and cutting edge; imagine.... a Curvature recliner in front of a curved flat screen - that would be any person's idea of a heavenly retreat. The large cupholders in each arm and cupholders in the fold down tables further enhance the surrounding in comfort effect. Enjoy reclining furniture like never before! The Curvature is available as Sofa and Loveseat sets as well as Sectional Sofa configurations. The Curvature's "wall hugger" design means seats can be placed only 4-7 inches from your wall and still fully recline allowing you to make maximum use of your living space. The Curvature Series is as comfortable as any Sofa Group seating made. It is an elegant addition to your home and is an excellent investment in American Made Comfort and Quality. The Curvature features the new Reclina-Pedic technology. Reclina-Pedic feature uses thick memory foam to cradle your body in relaxed comfort that soothes your muscles. 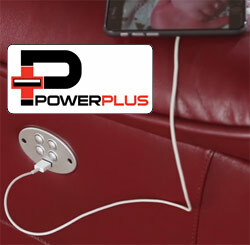 Power Plus provides you with USB charging ports (in the power recline controller) to charge your mobile devices.